Peri-implantitis is similar to periodontitis in natural teeth, however it occurs around a dental implant. It is characterized by the loss of bone surrounding the implant as well as inflammation and gum recession. As with traditional periodontal disease, early diagnosis is key to saving the dental implant and returning the mouth to a complete state of health. Peri-implantitis, just like periodontal disease, develops as a result of poor oral hygiene or as a complication from certain diseases. Recent studies have also linked peri-implantitis to an increased risk for heart disease, stroke, and pancreatic cancer. Just like with traditional periodontal disease, peri-implantitis can increase your chances for serious medical conditions making it vital to seek treatment as soon as symptoms occur. Below are before and after x-rays of an actual patient of Dr. Schultz. Before the LAPIP procedure, this patient was in danger of loosing his implants. After LAPIP, his implants are stable and in no danger of failure. The PerioLase® MVP-7™ was originally designed to perform laser gum surgery on natural teeth. However, in clinical studies, the laser has demonstrated an ability to eliminate the inflammatory reaction of peri-implantitis. The healthy tissue is allowed to regenerate, creating consistent and positive results in the regeneration of supporting tissues and bone. LAPIP® (Laser Assisted Peri-Implantitis Procedure) is a modification of the LANAP® (Laser Assisted New Attachment Procedure) protocol and can effectively treat the unique challenges of peri-implantitis. The PerioLase® MVP-7™ is able to target and remove the dark pigmented, diseased tissue around the affected dental implant. 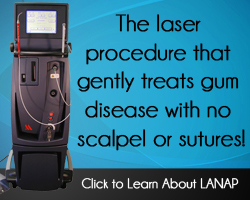 The laser is then able to gently remove this diseased tissue without harming the healthy tissue surrounding it. 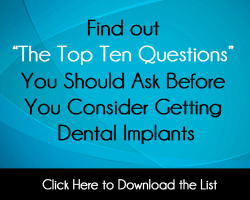 If you are suffering from Peri-Implantitis, LAPIP® may be a solution for you! Call our office today to schedule an appointment. Click on the thumbnails below to view a larger photo of a LAPIP case. Photos are courtesy of Dr. Michael Toms in Cincinnati, OH.